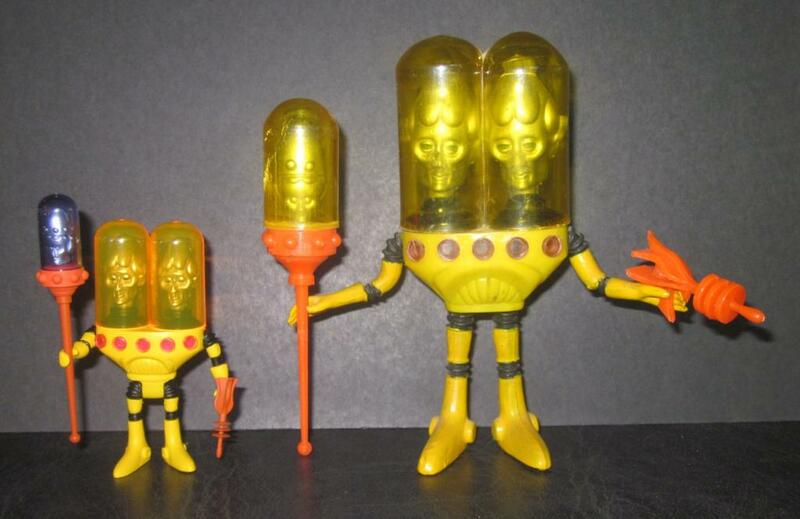 This page is for photos of the new Four Horseman aliens alongside their original counter parts! I think all of these, new and old are amazing toys, but I will draw comparisons between them. For those that aren't familiar with them, The 4H figures are poseable but they do not bend at every joint the way the Colorforms versions do. First we have Xodiac. I've custom painted my Xodiac's beard red, so obviously I like that better. The biggest real difference in appearance is the color of the gun and staff. I like the deeper shade of pink in the newer version better. His shorts are also different, with a round emblem and squarer shape. I don't really have a preference. 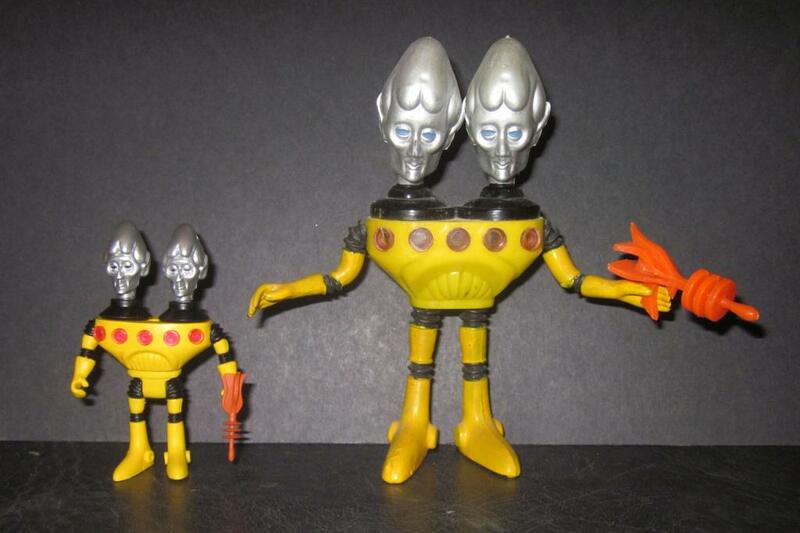 Here we have Orbitron. This is by far the most improved of all the OSM IMO. 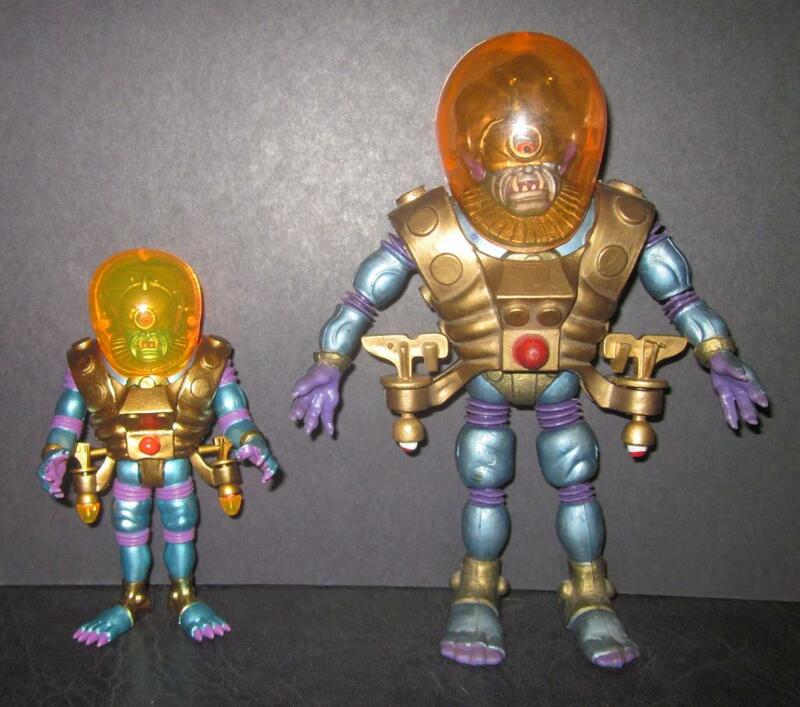 I liked the bigger chest, the clawed feet, and the gold tinted brain all much better than the original. I also really dig his new star shaped weapon. 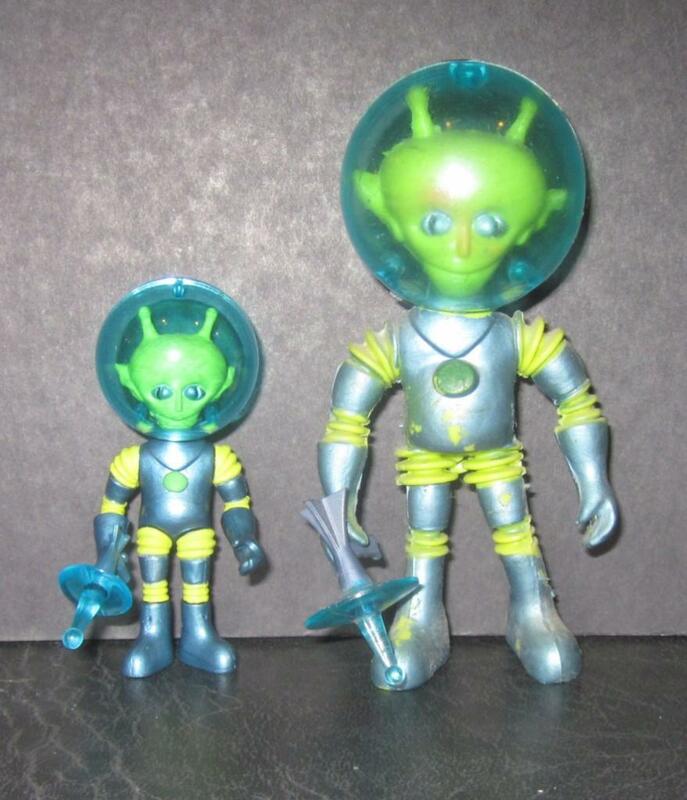 The new Orbitron just looks super cool! Next we have Mystron. Quality-wise these 2 are very similar. The biggest difference is that the wings and weapon of the new one is a super flat black, that looks very inferior to the original where you can really appreciate the sculpt job on the ribs of his wings. Also the new one has a head sculpt that just doesn't seem as sinister as the original. The shape of the new gun is actually cooler than the original, but the flat black doesn't really make it better. 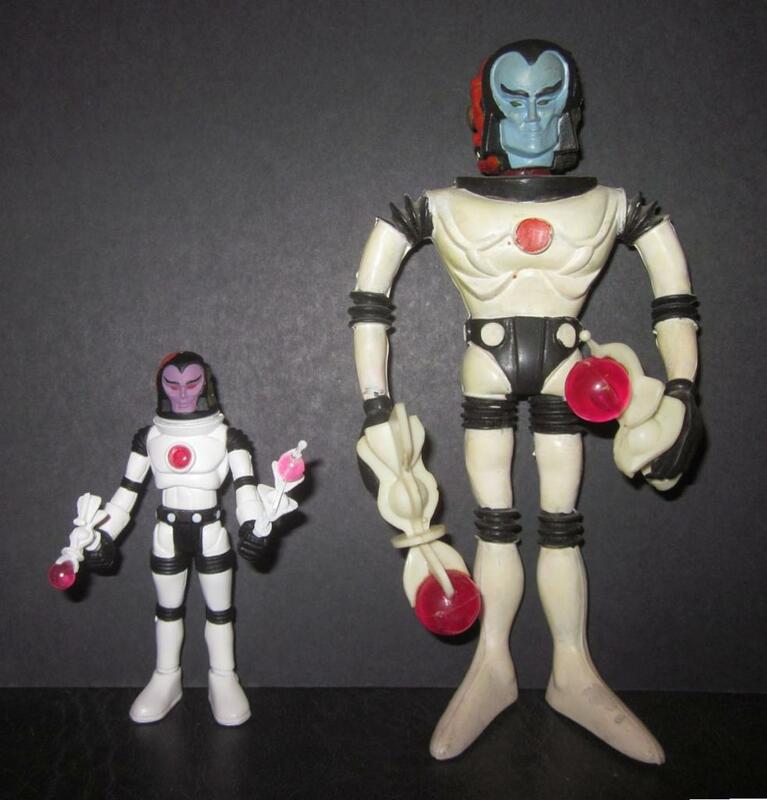 Next we have 2 different photos of Metamorpho. As can be seen the new one has purple instead of blue skin. 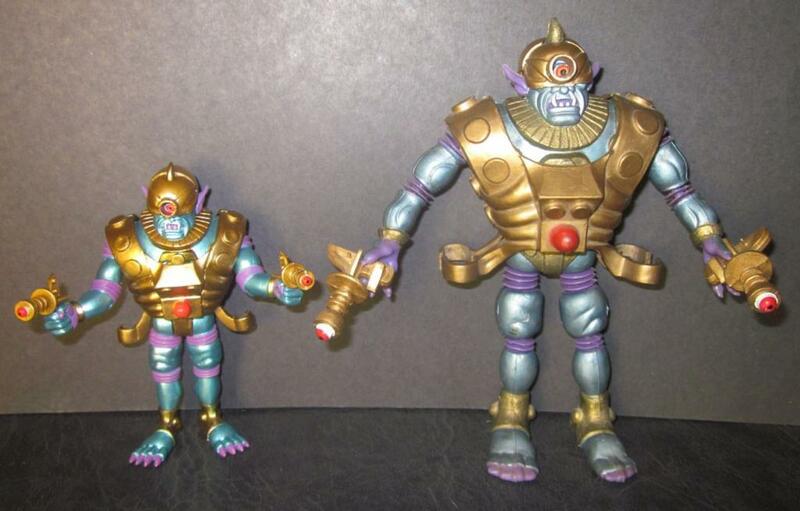 I like both but like the sculpt of the original better, but like the purple skin on the newer one better. I prefer the emblem on the chest of the newer version with the clear circle in the middle, but I like the normal crotch piece of the older version better than the block shape of the newer version. I also like the design on the chest of the older version better than the plain chest of the new version. 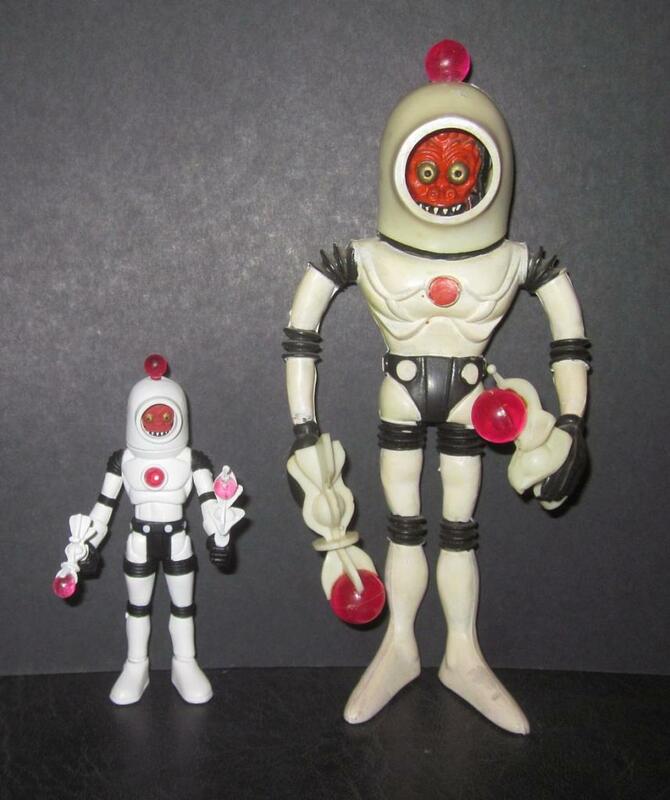 I also dig the original red face more than the new. Next we have Inferno. I much prefer the shape of the head and the shape of the fire of the original. 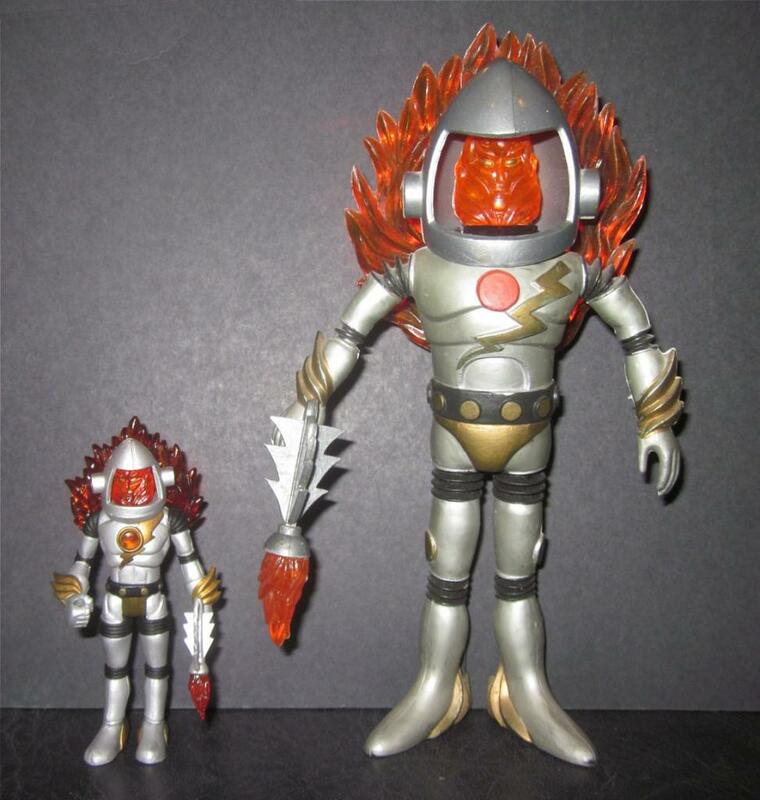 I also like the lightning bolt being separate from the red dot on his chest, and the normal looking crotch is always better than the square one which is really an artifact of the glyos design. The newer version does have the clear red dot on the chest which is a really cool feature (you can light the dot with a light from the back). Here we have Gemini. There are a lot of differences. First, the color of the top of his staff is different. The newer one has 2 separate helmets while the original has a one piece helmet. The one thing I like more about the newer version is the color of the discs on his chest. The things I think are really superior about the original is the proportionately longer arms and legs. I also like the lack of a crotch. It gives him a very inhuman look that is unique. 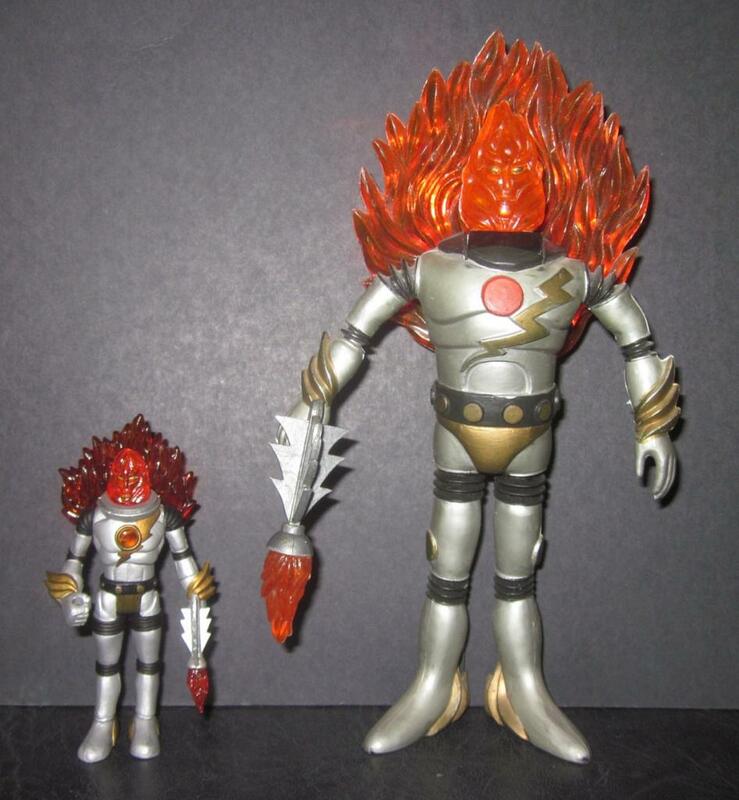 The new version with the crotch and shorter extremities has the general appearence of a human midget. Next we have Commander Comet. A slight problem with the new version is a crooked triangular emblem on his chest (it was recently pointed out that the triangle rotates so this is not a problem after all). 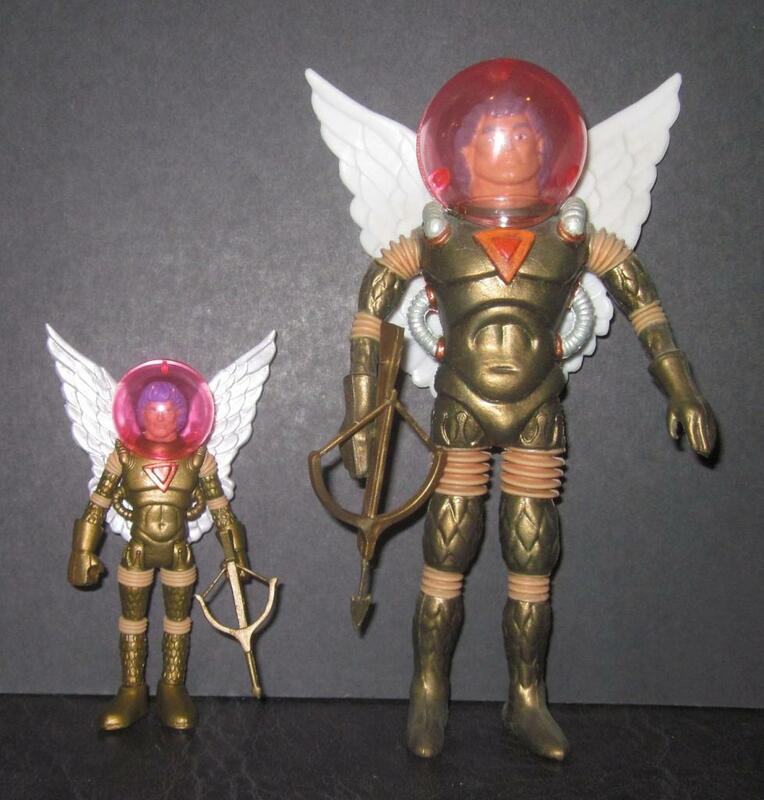 But I really like that he has silver wings and the face sculpt is a little better on the new version too. Over all, I still like the original better. 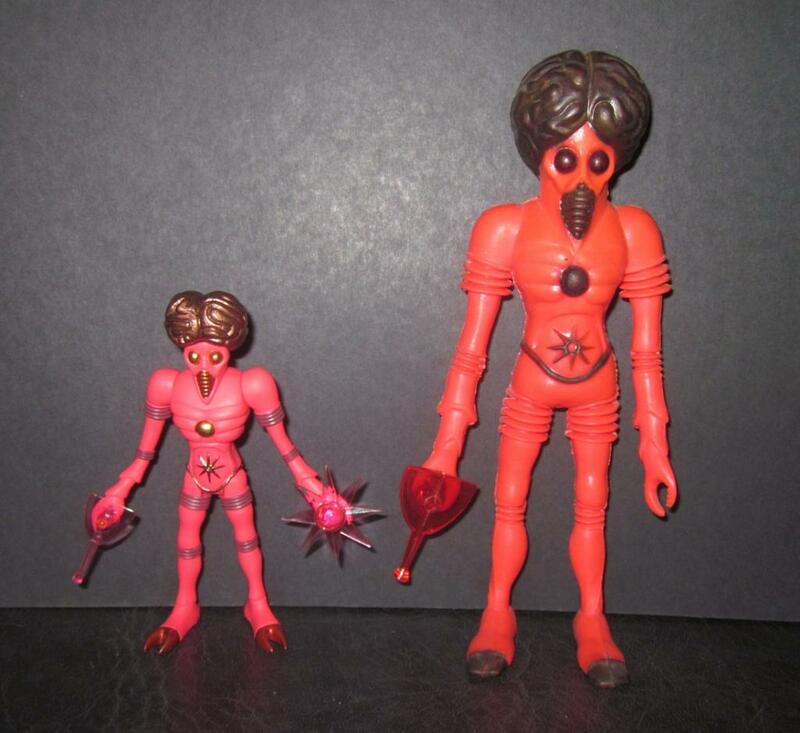 Next we have Alpha 7, which is probably the most faithfully reproduced of all the new aliens. The only significant difference is the much bluer color of the new version's suit. 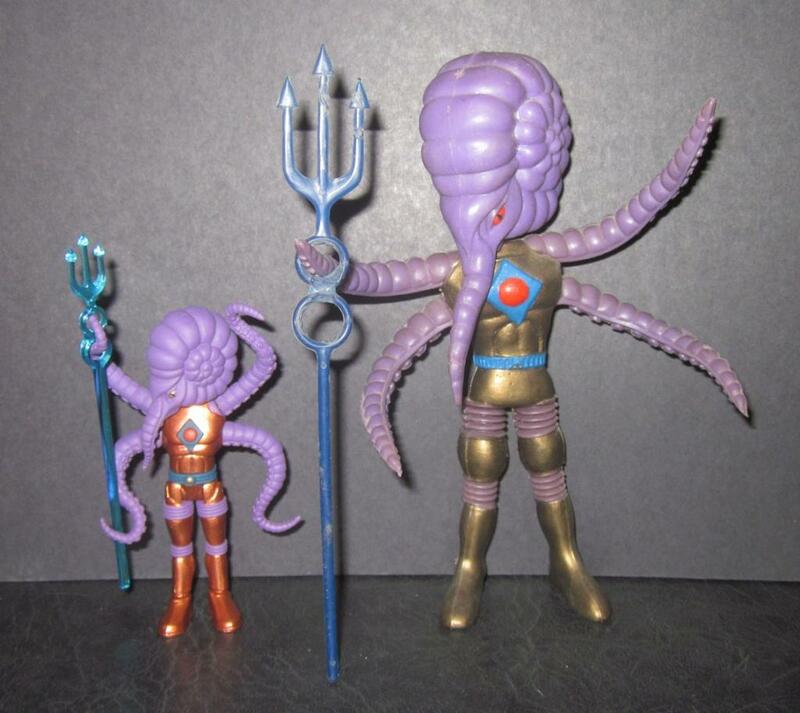 Next we have Astro-Nautilus. There are several differences here. The eyes are supposed to be the same color but I painted mine red which I think looks much cooler. The newer version has a clear triedent which I like a little better, and also has a brass colored suit instead of bronzish gold. I prefer the original as long as it's painted with bronze colored paint (the paint on the originals tends to turn into a dull bronze as it ages. I guess it oxidizes). Next we have my favorite, Cyclops. The most complex and largest of all the aliens. The remake is 68% of the size of the orginal, which makes it the closest in size of all the remakes to the original. (In comparison, the new Inferno is only 48% the size of the original). Despite the new Cyclops being a very faithful reproduction there are still many differences. The coolest thing about the new one is the metallic blue color of his skin. The original also has metallic blue skin but it just doesn't shine like the new one (the metallic shine is much more apparent in person than in photos). Other improvements are the armor. It pops together much easier than the old armor. Another difference is the feet. The new Cyclops has clawed toes which look very cool but something bout the shape of his old toes is just as cool. Another difference is that the new one has caps that go over the eye balls on the guns. 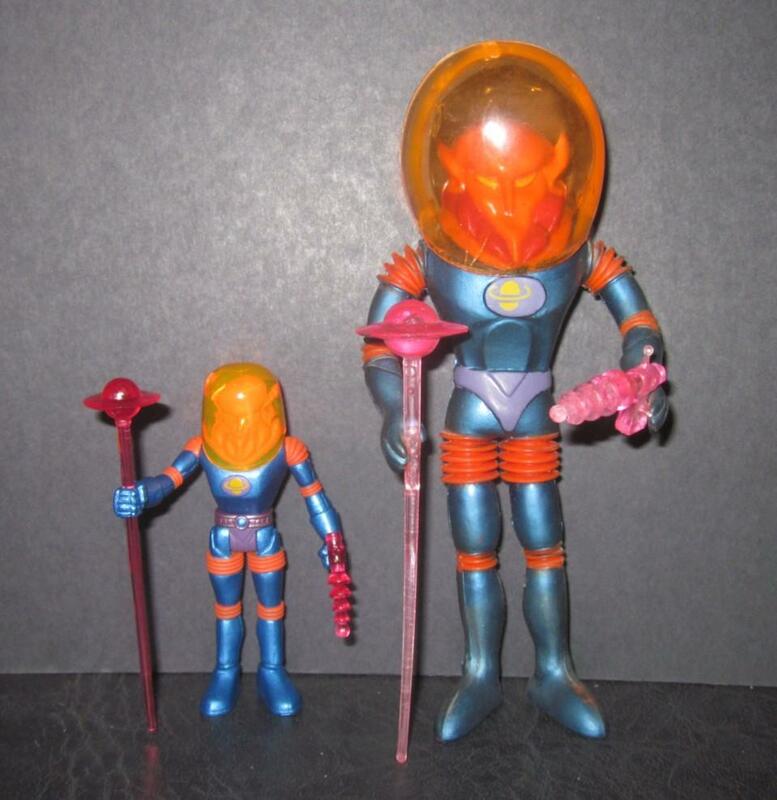 Ways in which the old Cyclops beats the new one hands down is the head sculpt and the helmet. In person the helmets look similar in quality, but when photographed the new one has a milky look that obscures his face. In addition, the old helmet, when photographed causes a nebulous effect that just looks very cool. The thing that sets the Cyclops apart the most though can only appreciated with his helmets off and that is the head sculpt. 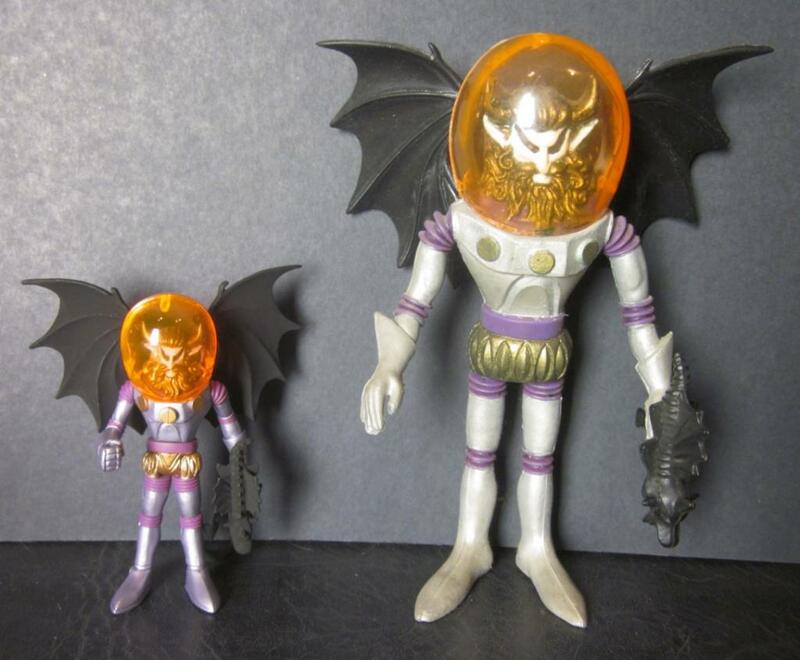 I feel the original face is just a lot cooler.